[by Leigh Ann Pfeiffer in San Diego, USA] San Diego is composed of neighborhoods divided by canyons, bay, ocean, and highways. 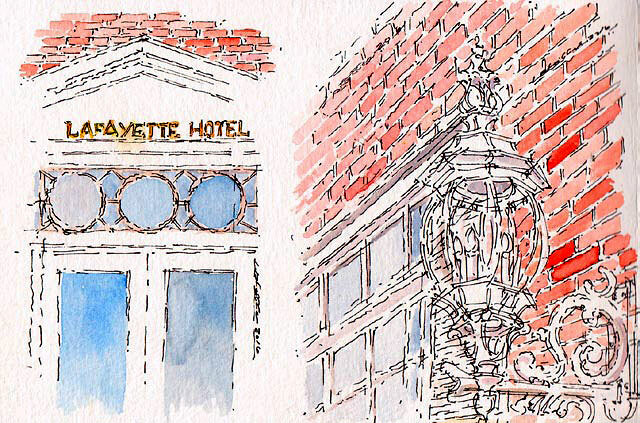 The Lafayette Hotel is part of the city that has undergone revitalization. My love for restoration and preservation of architecture is what drew me to this place. California is often known for emergence of new styles; however, the restraint to preserve is the art of this space. This location is in an urban 2.6 acre site, listed on National Register of Historic Places of San Diego, California. The hotel has emerged, via restoration and community awareness, as a cultural jewel in the city fabric. Details of the hotel, like the playful light fixtures of the main entry, are delightful and helped me to understand the essence of the space. Detailing of pediment and bracketed exterior light fixtures at the hotel entry frame the event of arrival. This is a destination for visitors and locals alike. Pop-up venues, live music and architectural details draw you in. Reflecting the materials and textures of the building, it was enjoyable to capture the building’s character with pen and ink dots, jots, dashes and lines. 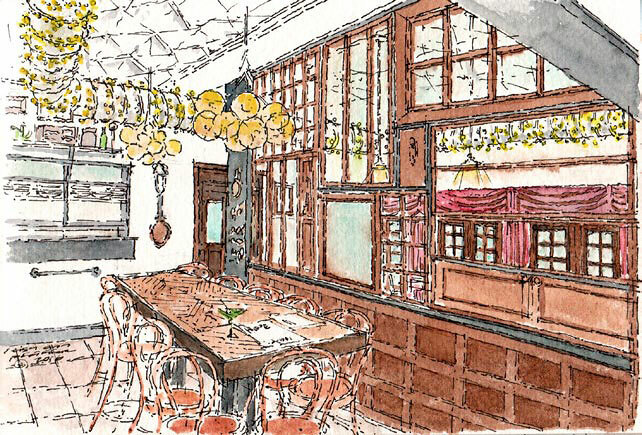 The interior of Hope 46, the restaurant of The Lafayette Hotel, consists of antique glass window panes and reclaimed wood. Along with watercolor, I used walnut ink to capture the essence of the vintage wood. This was the initial sketch that inspired me to sketch more of the interior and exterior of the hotel. 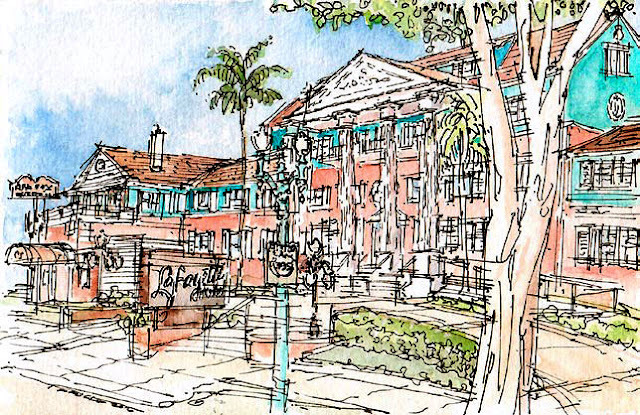 Leigh Ann Pfeiffer is a designer and professor with a focus on architectural design and city planning based in San Diego, California. You can see more of her sketches here.